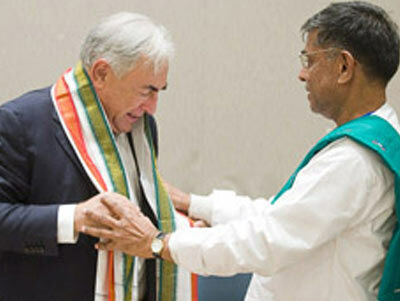 P. Changal Reddy, Secretary General of the Consortium of Indian Farmers Associations presents Dominique Strauss-Kahn with a shawl on behalf of the farming community. The CSO Townhall Meeting with IMF Managing Director Strauss-Kahn and World Bank President Robert Zoellick has become a tradition at the Annual Meetings. Last week’s event was the first townhall meeting for Strauss-Kahn, though he interacted informally with CSOs at the Spring Meetings. The townhall was one of the highlights of the Civil Society Policy Forum, a series of some 30 sessions organized by the IMF, World Bank, and CSOs themselves during the Annual Meetings. In his opening remarks, Strauss-Kahn stressed that the gravity of the situation in global financial markets was severe and pointed out the long-term consequences of the imbalances in the financial sector on growth. While growth in advanced economies will not be above zero next year, overall growth of the global economy will be around 3 percent, all coming from emerging countries and low income countries. He added that as a result of the crisis, the sources of global growth will be emerging market countries and low income countries. He added that the twin crises facing the global economy demonstrated the need for changes in the international financial architecture and in the governance structure of the international institutions. He laid out his four-pillar approach to IMF governance reforms — the IEO report on “Governance of the IMF,” the working group of the IMF Executive Directors, the committee of eminent persons whose work is currently underway, and direct interaction with civil society organizations — intended to build a broad consensus over this ongoing process. He added that “there’s no way to work on governance without this fourth leg” — consultations with civil society. In his remarks, Bank President Zoellick said that since he joined the Bank in 2007 he has been pleased to have seen the depth and extent of the Bank’s diverse work with civil society groups. On the food and fuel crisis he said malnutrition is the forgotten Millennium Development Goal. While it is part of the first MDG, it is also the multiplier goal, because the saddest effect of malnutrition is that it can stunt people for life. He agreed with Strauss-Kahn that effects of the financial crisis are going to be felt in many developing countries. He said that “we could be at a tipping point in terms of the effects on their growth” and their financial systems. In the discussion that followed, CSO representatives asked Strauss-Kahn and Zoellick questions on various issues, including a question on the concept for growth as a driver for development. Strauss-Kahn responded that growth was not always good for development, which West Africa’s experience in the last five or six years has clearly shown. The region experienced a rate of growth in the last five years of around 5 or 6 percent — which hadn’t happened for 30 years — but it has almost no effect on reducing poverty. He said that while it is difficult to fight against poverty without growth, growth is not enough. “You also need good policies to alleviate poverty,” he added. That is why the Fund is working with countries to provide an economic environment which makes development possible. “But we also have in mind the fact that we cannot rely only on any kind of growth or only growth to fight against poverty,” he added.